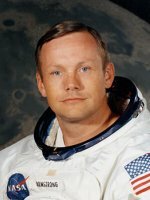 We noted the recent passing of astronaut Neil Armstrong, who died at the age of 82. An AP obituary described him as a "soft-spoken engineer who became a global hero." We all know Armstrong as the first person to set foot on the moon after he commanded the Apollo 11 spacecraft and Eagle landing on July 20, 1969. But just what did he do as an engineer? According to NASA's website, his engineering exploits combined with his aviator background to create an illustrious legacy. Born in Wapakoneta, Ohio, Armstrong received a Bachelor of Science Degree in Aeronautical Engineering from Purdue University and a Master of Science in Aerospace Engineering from the University of Southern California. He was Professor of Aerospace Engineering at the University of Cincinnati from 1971 to 1979. During 1982-1992, Armstrong served as chairman of Computing Technologies for Aviation, Inc., Charlottesville, VA. Earlier on, after serving as a naval aviator from 1949 to 1952, Armstrong joined the National Advisory Committee for Aeronautics (NACA) in 1955. His first assignment was with the NACA Lewis Research Center (now NASA Glenn) in Cleveland. Over the next 17 years, he was an engineer, test pilot, astronaut, and administrator for NACA and its successor agency, the National Aeronautics and Space Administration (NASA). As a research pilot at NASA's Flight Research Center, Edwards, CA, he was a project pilot on many pioneering high-speed aircraft, including the well known, 4000-mph X-15. He has flown over 200 different models of aircraft, including jets, rockets, helicopters, and gliders. Armstrong transferred to astronaut status in 1962 and was assigned as command pilot for the Gemini 8 mission launched in 1966. On this, Armstrong performed the first successful docking of two vehicles in space. As spacecraft commander for Apollo 11, the first manned lunar landing mission, Armstrong gained the distinction of being the first person to land a craft on the moon and first to step on its surface. He and Buzz Aldrin spent nearly three hours walking on the lunar surface, collecting samples, conducting experiments, and taking photographs. Fellow Ohioan and astronaut John Glenn recalled recently how Armstrong was down to the last 15 to 35 seconds of fuel when he finally brought the Eagle down on the Sea of Tranquility. The landing met an audacious deadline that President Kennedy had set in May 1961, shortly after Alan Shepard became the first American in space with a 15-minute suborbital flight. To be considered for employment, your name must be placed on a State Civil Service List. To learn more about these opportunities and to apply, visit the State Civil Service Commission website at www.scsc.state.pa.us, select Job Seekers, and then click on the announcement numbers referenced above. For even more information, visit the PennDOT website at www.dot.state.pa.us, select Employment, and then click on PennDOT HR Offices to obtain a complete list of phone numbers by geographical area. On a recent trip to New York City to cover an upcoming story for Progressive Engineer Magazine (and also to Boston to visit two of my sisters), I detoured north of I-84 and stopped in Poughkeepsie, NY to experience the Walkway Over the Hudson State Historic Park. The park opened to rave reviews in 2009 after a two-year project converted the 1.25-mile-long, 212-foot-high Poughkeepsie-Highland Railroad Bridge to a 25-foot-wide pedestrian walkway over the Hudson River. According to an article in the November 2009 issue of PE magazine, the bridge originally opened in 1889 to allow transport of coal from Pennsylvania and grain from the Midwest to New England cities, and it closed after a fire in 1974. Walkway Over the Hudson, a nonprofit group, spearheaded the $35-million project to revitalize it through a fast-track design process led by Bergmann Associates, a multidisciplinary engineering firm headquartered in Rochester, NY. McLaren Engineering Group, a civil and structural engineering firm headquartered in West Nyack, NY, served as a subconsultant. Engineers restored the bridge to meet highway load standards to handle multimodal traffic and emergency vehicle use (the day I visited, cranes were operating from the concrete deck performing maintenance work).